The Associated Press has been honoring college football’s best with an All-America team since 1925. The full three-team AP All-America selections will be unveiled in December. The ninth All-America watch of the season features West Virginia’s virtually unblockable linebacker, UCLA’s bright spot tight end and Temple’s rolling Rock. The Mountaineers’ leading tackler is coming off his best game of the season. He had four tackles for loss and three sacks in a rout of TCU last week. The fourth-year junior is undersized at 5-foot-11 and 221 pounds, but in the Big 12 his quickness allows him to stay on the field against spread offenses. Long, one of 10 semifinalists for the Butkus Award as the nation’s best linebacker, is second in the nation in tackles for loss per game with 1.94 and the leader of the third-best defense (5.23 yards per play) in a conference where stops are hard to come by. What they are saying: “You can’t block him. He keeps his feet. He keeps getting banged up and still makes tackles.”— West Virginia coach Dana Holgorsen. 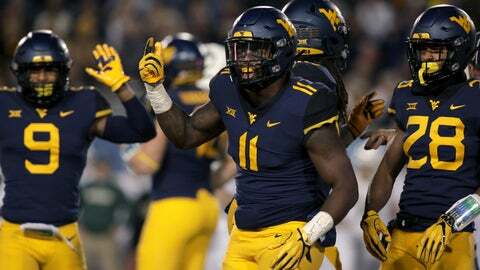 Outlook: Tough for Big 12 defensive players to get a lot of recognition and linebacker is always a loaded spot nationally, but Long and the Mountaineers will be in the spotlight down the stretch. Wilson leads all tight ends with 718 yards receiving after his best game of the season last week against Arizona State. The junior caught 11 passes for 164 yards and two touchdowns. UCLA’s offense has struggled most of the season with inexperience and injuries at quarterback, but the 6-foot-5, 235-pound Wilson is still proving to be a downfield threat and possible first-round NFL draft pick. Dobbins ran for 1,403 yards and 7.23 yards per carry as a freshman last season, showing a blend of power and speed. He came into this season with some Heisman buzz and the possibility of being a focal point in the Buckeyes’ loaded offense. Instead, his performance has epitomized the team’s inability to consistently establish the run. Dobbins has been held under 4.0 yards per carry in five of the last six games, breaking out for a season-high 164 yards rushing against Nebraska two weeks ago and then managing just 28 on 14 attempts last week against Michigan State. Armstead is averaging 122.25 yards rushing per game, and has been rolling the last two weeks with 252 yards on 57 carries after missing the previous two games with an ankle injury. Against Houston last week, Armstead scored six touchdowns to lead the Owls to a victory that made them bowl eligible. The 5-11, 211-pound senior has occasionally seen time as a third-down pass rusher for Temple, but now he is the engine of a surging offense that has put up 1,207 yards in the past two games. The 308-pound junior moved into the starting lineup this season to fill the spot left by first-round draft pick Mike McGlinchey. “Eichenberg has been great in pass protection in his initial season as a starter and helped pave the way for the Fighting Irish being undefeated. He is a physical presence up front.” — Cubelic. Two under-the-radar Pac-12 stars are likely to take part in a more than a few collisions in Pullman, Washington, on Saturday. Taylor is a 5-6, 184-pound workhorse for the Wildcats, who are in the process of trying to salvage a seemingly lost season. Taylor is sixth in the nation in rushing at 122.10 yards per game and fifth in carries at 207. Pelluer is a sixth-year season who will set a school record this week by playing in his 52nd game. He leads the Cougars in tackles with 71 on the season.